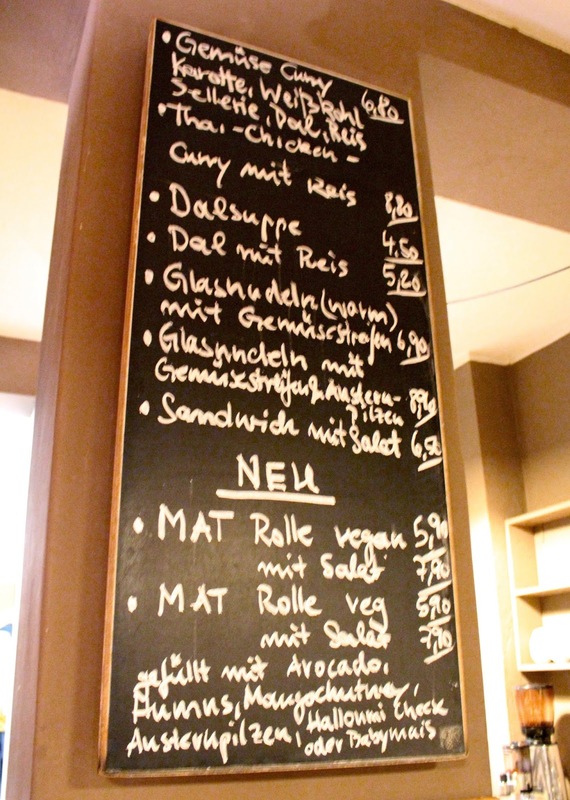 Even though the Germans still love their beer and schnitzels, the health hype also seems have crept into Munich. 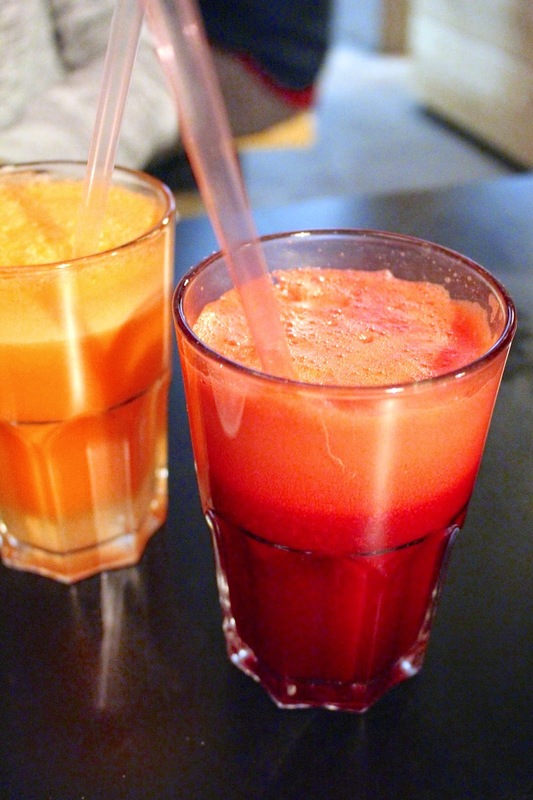 There's lots of healthy cafés and juice places to choose from. One of those healthy hotspots is Orangebox in Türkenstraße. A no-nonsense healthy eatery with a short but sweet menu, and juices made freshly on the spot. When you enter Orangebox, you're greeted by the friendly staff who you can see through the open kitchen. The menu is short and I believe seasonal, so choosing is quite easy and straightforward. Once you've decided what to eat, you can pick your favourite fresh juice combination, and pass your order at the till. I ordered my favourite beetroot, carrot & ginger juice and Annemerel went for something without beetroot it seems but I can't remember what she had. Fresh juices are the best! 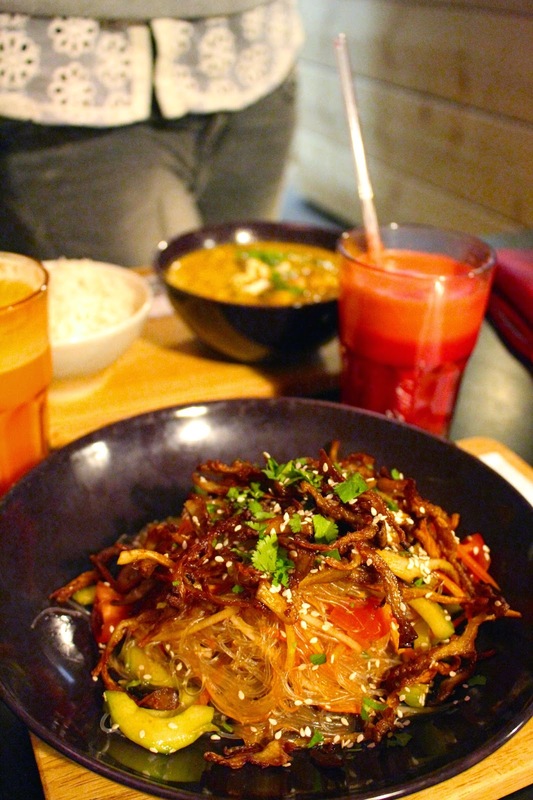 While Annemerel chose for a comforting vegetable curry, I opted for the glass noodle salad with oyster mushrooms. Both dishes were really full of flavour and equally delicious. The curry was spicy and not boring at all, despite just being a simple veggie curry. My glass noodle salad was super tasty, nothing else I'd add, except a little soy sauce maybe. There was some crunchy stuff on top of the salad (maybe mushrooms?) which gave the salad a nice crunch. I also went back to Orangebox another day and tried a mango lassi.. I promise it's worth making a detour for (okay depending where you live, but in case you live in Munich: make that detour!). I'm a big fan of Orangebox and I'll definitely be back for more lunches in spring! They have no website but more info can be found here.